Roth, R. E. (2017). User Interface and User Experience (UI/UX) Design. The Geographic Information Science & Technology Body of Knowledge (2nd Quarter 2017 Edition), John P. Wilson (ed.). DOI: 10.22224/gistbok/2017.2.5. This entry was published on June 18, 2017. This Topic is also available in the following editions: DiBiase, D., DeMers, M., Johnson, A., Kemp, K., Luck, A. T., Plewe, B., and Wentz, E. (2006). Dynamic and interactive displays. The Geographic Information Science & Technology Body of Knowledge. Washington, DC: Association of American Geographers. (2nd Quarter 2016, first digital). Advances in personal computing and information technologies have fundamentally transformed how maps are produced and consumed, as many maps today are highly interactive and delivered online or through mobile devices. UI (user interface) / UX (user experience) describes a set of concepts, guidelines, and workflows for critically thinking about the design and use of an interactive product (Garrett, 2010), map or otherwise. UI/UX is a growing profession in the geospatial industry and broader technology sector (Haklay, 2010), with UI/UX designers needed to engage with stakeholders and target users throughout large software engineering and web design projects (see Additional Resources, below). This entry reviews the conceptual principles behind UI/UX, emphasizing design following other entries in the Cartography & Visualization section and complementing the technological-focused User Interfaces entry spanning GIScience in the Programming & Development section. UI and UX are not the same, separated in their focus on interfaces versus interactions. An interface is a tool, and for digital mapping this tool enables the user to manipulate maps and their underlying geographic information. An interaction is broader than the interface, describing the two-way question-answer or request-result dialogue between a human user and a digital object mediated through a computing device (Roth, 2012). Therefore, an interaction is both contingent—as the response is based on the request, creating loops of interactivity—and empowering—giving the user agency in the mapping process with changes contingent on his or her interests and needs (Sundar et al. 2014). Therefore, humans use interfaces, but they experience interactions, and it is the experience that determines the success of an interactive product (Norman, 1988). UI design describes the iterative set of decisions leading to a successful implementation of an interactive tool while UX design describes the iterative set of decisions leading to a successful outcome with the interactive, as well as a productive and satisfying process while arriving at this outcome. Accordingly, UI/UX often is reversed as UX/UI to emphasize the importance of designing the overall experience rather than just the interface. Within GIScience, interaction most commonly is treated by the research thrust of geographic visualization (see Geovisualization). Interactivity supports visual thinking, enabling users to externalize their reasoning by requesting a wide range of unique map representations (DiBiase, 1990), thus overcoming the limitations of any single map design. Geovisualization encourages this interactive reasoning for the purpose of exploration rather than communication (see Cartography & Science), with the goal of generating new hypotheses and spontaneous insights about unknown geographic phenomena and processes (MacEachren & Ganter, 1990; MacEachren, 1994). As a result, much of the early research on interaction in cartography and visualization is specific to scientific discovery, considering expert specialists as the target user groups. Today, UI/UX design requires consideration of use cases beyond exploratory geovisualization and users beyond expert researchers. Interaction allows users to view multiple (sometimes all) locations and map scales as well as customize the representation to their interests and needs. As stated above, interaction also empowers users in the cartographic design process, improving accessibility to geographic information and dissolving traditional boundaries between mapmaker and map user (see Cartography & Power). Increasingly, interaction enables geographic analysis, linking computing to cognition in order to scale the human mind to the complexity of the mapped phenomenon or process (see Geovisual Analytics). Accordingly, interaction has been suggested as a fundamental complement to representation in cartography, together organizing contemporary cartographic scholarship and practice (Roth, 2013a; Figure 1). 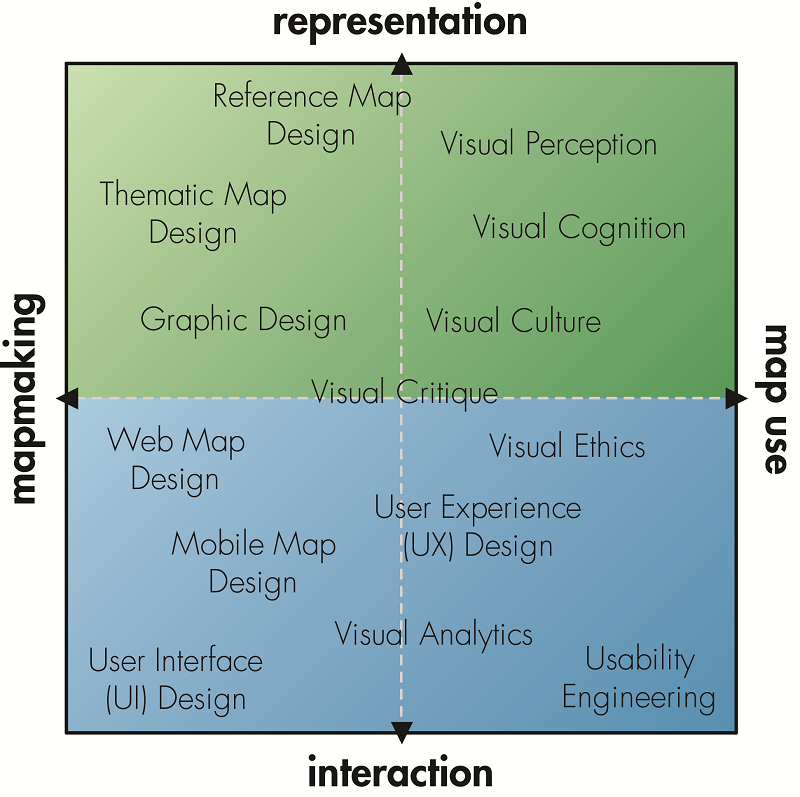 For discussion of additional influences on UI/UX design in cartography and visualization, see Geocollaboration (forthcoming), Usability Engineering and User-Centered Design (forthcoming), and Web Mapping. 1. Forming the goal: The goal is what the user is trying to achieve with the interface and therefore represents the user’s motivation for using the interface (a need, interest, curiosity, etc.). Goals are described as “high-level” tasks, and may include exploration, analysis, synthesis, and presentation (see Geovisualization). 2. Forming the intention: The intention is the specific map reading objective that the user completes in support of the goal. Accordingly, intentions are described as “low-level” tasks. Intentions include identification of a map feature, comparison of two map features, ranking of a set of map features, etc. Therefore, an intention yields a specific geographic insight, such as detection of a difference, change, outlier, anomaly, correlation, trend, cluster, or spike. 3. Specifying an action: The user then must translate their intention to the functions (described below as operators) implemented in the interface. The interface needs strong affordances―or signals to the user about how to interact with the interface―for the user to specify which operator best supports the intention before executing the action. 4. Executing an action: The user then must execute the specified action using input computing devices, such as a pointing device (e.g., mouse, touchscreen), keying device (e.g., keyboard, keypad), or other mode (e.g., gesture or speech recognition). Once the action is executed, the computing device processes the request and, if successful, returns a new map representation to the user. 5. Perceiving the system state: Once returned, the user then views the new representation. Here, strong feedback―or signals to the user about what happened as a result of the interaction―is needed to clarify how the map changed after the request. It is through this provision of feedback that the map participates in the two-way interaction dialogue. 6. Interpreting the system state: After perceiving the change to the map representation through feedback, the user then must make sense of the update. One way to describe this stage is completion of the intention: once a new map is returned, it can be used to carry out the user’s low-level task and, if successful, generate a new geographic insight. 7. Evaluating the outcome: The evaluation compares the insight with the expected result to determine if the goal has been achieved. This includes critical evaluation of the insight ("does this seem right?") and meta-evaluation of the overarching goal ("do I have my answer?"). Following this evaluation, the user may revise their goal and initialize a new interaction exchange, restarting the seven stage sequence. Norman described breakdowns between the user and the map (Stages #1-4) as the “gulf of execution”, or the mismatch between user tasks and supported operators, and breakdowns between the map and the user as the “gulf of evaluation”, or the mismatch between the result of the operator and the user’s expected result. Table 1 works through Norman’s seven stages of interaction and lists UX design solutions available when a breakdown at a given stage is observed (adapted from Roth, 2013a). Table 1. Norman (1988) reduced an interaction into seven discrete, observable stages. An observed breakdown at a given stage suggests a specific set of UX solutions (adapted from Roth, 2013a). The user’s goal is not supported by the interactive (Type I error), or the user does not think that the interactive supports his or her goal (Type II error). • Complete a needs assessment to define user goals. • Implement strategies to improve user expertise and motivation. The user cannot complete one or several low-level tasks or relies on map reading alone to complete low-level tasks without interacting. • Develop use case scenarios based on low-level tasks. • Evaluate the interactive using benchmark tasks. The user does not understand how the provided interface functionality supports their goals and intentions. • Implement startup and tooltip help. • Configure the map with a smart default to show how the UI and map relate. The user does not understand how to submit information to the interface through the input devices or incorrectly used the input devices. • Improve flexibility to support multiple input devices. • Reduce point mileage and workload to avoid errors. • Use accelerators to speed interaction. • Use visual metaphors drawn from real-world interactions. The user does not notice how the map changed due to the interaction. • Improve visual feedback through highlighting. • Provide summary information to compare before and after interacting. • Use breadcrumbs to remind the user how they interacted. The user does not understand what the change in the map means. • Combine visualization with statistical computation to highlight significant insights (see Geovisual Analytics). The user does not receive information from the interaction that helped them achieve their goal. • Provide visual provenance to track interactions across exchanges. • Support enabling operators (e.g., save, annotate, export) to collect insights during interaction. • Support collaboration to share insights. A number of disciplines, professions, and knowledge areas contribute to UI/UX design, including ergonomics, graphic design, human-computer interaction, information visualization, psychology, usability engineering, and web design. Additional frameworks for understanding UX design have been offered as UX becomes formalized conceptually and professionally (see Roth, 2013a, for a review). For instance, Fitts’ (1954) law providing an early understanding of pointing interactions was based on psychology studies about human bodily movement. The law specifies how quickly a user can point to an object (either physically with a touch display or digitally with a mouse or other device) based on the size of the object and its current distance from the pointer. Further, Foley et al.’s (1990; 2014) three design levels (the conceptual, operational, and implementational levels, as discussed for mapping by Howard & MacEachren, 1996) were derived from research on human-computer interaction while Garrett’s (2010) five planes of design (the surface, skeleton, structure, scope, and strategy planes, as discussed for mapping by Tsou, 2011) are offered from web design experience. Finally, most recommendations describe UI/UX as a design process that includes multiple, user-centered evaluations, making use of methods and measures established in Usability Engineering (see Usability Engineering and User-Centered Design, forthcoming). As with representation design and the visual variables (see Symbolization & the Visual Variables), an interaction can be deconstructed into its basic building blocks (Figure 2). Interaction primitives describe the fundamental components of interaction that can be combined to form an interaction strategy (Roth, 2012). Scholars in cartography (e.g., Cartwright et al., 2001) and related fields (e.g., Thomas & Cook, 2005) identify development of a taxonomy of interaction primitives as the most pressing need for the understanding of interaction, as such a taxonomy articulates the complete solution space for UI/UX design. Accordingly, there are now a range of taxonomies offered in the UI/UX literature, including taxonomies specific to cartography and visualization (e.g., Dykes, 1997; MacEachren et al., 1999; Crampton, 2002; Andrienko et al., 2003; Edsall et al., 2008). Interaction primitive taxonomies differ by the stages of interaction they include. While UX design considers primitives at all stages, UI design primarily focuses upon interaction operator primitives (Stage #3: Specifying the Action, as defined above), or the generic functions implemented in the interactive that enable the user to manipulate the display. Operators include panning, zooming, and detail retrieval—functions common to “slippy” web maps using tilesets (see Web Mapping)–as well as reexpression to different visual overviews, overlay of context information, and filtering across multiple facets of the mapped dataset–functions essential to Shneiderman’s (1996) information seeking mantra in big data visualizations (see Big Data Visualization). Table 2 describes common operator primitives in cartography and visualization, synthesizing UI/UX recommendations (adapted from Roth, 2013b). Table 2. UI design relies upon interaction operator primitives. UI design recommendations specific to cartography and visualization are beginning to emerge for each operator (adapted from Roth, 2013b). Set or change the displayed map representation without changing the information. • Reexpress to a proportional symbol map type on web maps to overcome issues with normalization and Web Mercator. • Reexpress cartograms as choropleth maps to support identification tasks. • Reexpress temporal sequences when interested in linear and cyclical time. • Reexpress between maps and non-map representations to reveal anomalies present in different visual structures. Generate and advance through an ordered set of related maps, each with different information. • Constrain the binning unit to intervals in space, time, or attributes that make sense for the use case scenario. • Sequence all animations (temporal or otherwise) to give users controls over the playback. Change the feature types included in the map for additional context. • Overlay only a small subset of context layers for general users to avoid meaningless overplotting. • Overlay custom layers (via import) for expert users to support association tasks (e.g., correlations, cause-effect relationships). • Overlay visual benchmarks providing summary context (e.g., average, max-min) to support comparison and ranking tasks. Set or change the design parameters of a map without changing the map type. • Constrain resymbolization for general users to avoid misleading representations. • Resymbolize all design parameters for expert users to manage visual hierarchy while interacting. • Resymbolize class breaks to support ranking and delineation (e.g., clusters, spikes) tasks. • Resymbolize through direct manipulation of the legend. • Dynamically update the legend when resymbolizing. 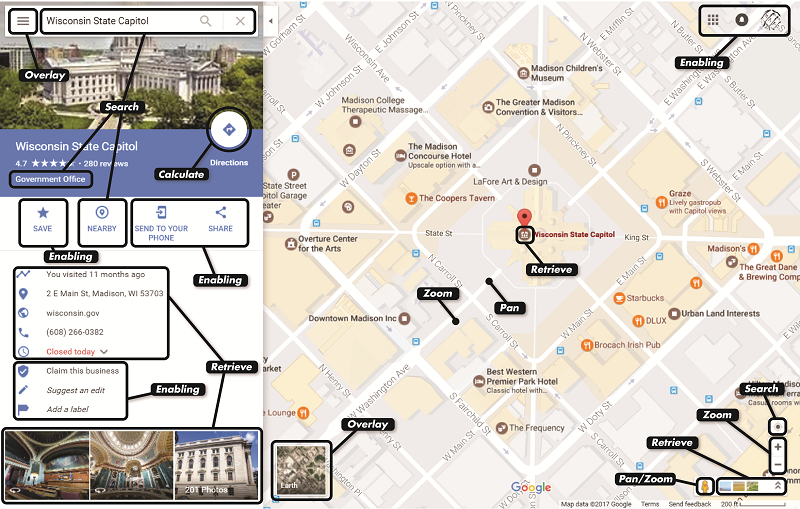 • Increase the level of detail in the map when zooming into the map (i.e., “semantic” zoom). • Consider conventional tileset zoom level map scales when generalizing linework for mapping on the web. • Zoom only to a subset of relevant map scales appropriate for the level of detail of the linework. • Include a widget to zoom out to the smallest/default map scale. Change the geographic center of the map. • Limit the mouse/pointer mileage needed to pan between map features for the goal of presentation and general users. • Reproject when panning and zooming if not computationally restrictive. • Rotate away from north-up for egocentric mobile applications supporting navigation. Remove/highlight map features within a feature type that do not meet one or a set of user-defined conditions. • Support filtering over searching for the goal of exploration and expert users. • Use slider widget to filter by numerical facets and checkboxes/radio buttons to filter by categorical facets. • Filter to complete complex ranking and delineation tasks. • Require the user to click a “submit” button for complex filtering taking longer than 100 milliseconds to avoid perceived lags in interaction. Add/highlight a map feature of interest. • Support searching over filtering for the goal of presentation and general users. • Search to complete simple identification tasks. • Support spatial search by the user’s location on mobile devices. Request details on demand about a map feature of interest. • Retrieve details to complete simple identification tasks. • Layout the UI controls so that detail retrieval occurs after other interactions that reduce the candidate map features to a subset of interest (following Shneiderman’s mantra). • Move from an information window that activates atop the map to a docked information panel as the f information complexity about the map features increases. Manipulate the layout of maps, coordinated views, and map elements. • Constrain arrangement for the goal of presentation and general users to avoid misleading representations. • Separate coordinated views into dialog windows for mobile. Derive new information about a map feature of interest. • Use persistent interfaces over nested interfaces when supporting complex calculations. • Make visual as many components of calculations and models through the interface. Not all maps need to be interactive, and not all interactive maps require the same UI design. Interface scope describes the baseline number of operators implemented in an interactive product (e.g., just panning and zooming versus panning, zooming, searching, filtering, etc. ), while interface freedom describes the precision by which each operator can be executed (e.g., zooming any map scale versus only ~20 pre-processed scales). Together, scope and freedom determine the interface complexity, or the total number of unique representations that can be created through the interface. Much like managing information complexity in cartographic design (see Scale and Generalization), managing interface complexity is essential for good UI/UX design. The appropriate balance of flexibility versus constraint in the UI/UX design ultimately should be determined through user input and evaluation (see Usability Engineering and User-Centered Design, forthcoming). An operator is implemented in one of several interface styles, also called modes, or the manner by which user input is submitted to perform the operator (Shneiderman & Plaisant, 2010 as discussed for mapping by Howard & MacEachren, 1996). The same operator can be implemented multiple times through different interface styles, allowing users to complete the same objective with an interface through different interaction strategies, a design concept described as interface flexibility. In graphic user interfaces (i.e., GUIs), the interface style is the widget, menu, or form that triggers an event when input is received; the operator is the business logic that is executed after the event is handled. Interface styles are defined by their level of directness in submitting input (Figure 3). Fully direct manipulation enables probing, dragging, and other adjustments to graphic elements of the UI. For cartography and visualization, direct manipulation can be applied to individual map features (common for detail retrieval), the entire map (common for panning, zooming, and reprojection), map elements like a legend (common for filtering and resymbolizing), a linked information graphic or visualization (common for reexpression of overviews, filtering, and detail retrieval in a coordinated visualization), or simply a custom widget such as buttons or slider bars (common for filtering, toggling overlays, and sequencing through a map series or animation) (Roth, 2013a). Less direct interface styles include menus, or the selection of one or more items from a list (common for filtering), and forms, or the keying of characters into a blank textbox (common for searching). The move towards mobile-first or post-WIMP (Windows, Icons, Menus, and Pointers) design in cartography has substantially changed how direct interface styles are designed in order to support imprecise (finger-based) touch interactions (see Mobile Maps & Responsive Design). Command language and natural language styles are indirect and non-graphic styles for implementing operators. Shneiderman & Plaisant (2010) provide a comprehensive summary of the relative advantages and disadvantages of interface styles for UI design. As with paper or static cartographic design (see Aesthetics and Design, forthcoming), the visual look and feel of the UI design is “more than just icing on the cake”: it sets the tone for the entire user experience, from setting the mood and evoking an appropriate emotional response through improving usability and subjective satisfaction. UI design is a highly creative process, and creation of a coherent and unique visual brand relies on iterative refinement of global design decisions (e.g., interface layout and responsiveness, application navigation, visual affordances and feedback, color scheme, typefaces) and local design decisions (e.g., visual metaphors for direct manipulation interface widgets, specific text phrasing for icons, tooltips, and information windows). Nielsen (1994) provides a useful set of usability heuristics for guiding visual interface design. DiBiase, D. (1990). Visualization in the earth sciences. Earth and Mineral Sciences, 59(2), 13-18. Edsall, R., Andrienko, G., Andrienko, N., & Buttenfield, B. (2008). Interactive maps for exploring spatial data. ASPRS Manual of GIS. Garrett, J. J. (2010). The elements of user experience: user-centered design for the web and beyond. Pearson Education. Haklay, M. M. (Ed.). (2010). Interacting with geospatial technologies. John Wiley & Sons. Howard, D. and MacEachren, A. M. (1996). Interface design for geographic visualization: Tools for representing reliability. Cartography and Geographic Information Systems, 23(2), 59-77. Hughes, J. F., Van Dam, A., Foley, J. D., & Feiner, S. K. (original edition 1990; latest edition 2014). Computer graphics: principles and practice. Pearson Education. MacEachren, A. M. (1994). Visualization in modern cartography: setting the agenda. Visualization in modern cartography, 28(1), 1-12. Thomas, J. J., & Cook, K. A. (2005). Illuminating the path: the research and development agenda for visual analytics. IEEE Computer Society. Describe traditional and emerging use cases for interactivity in cartography and visualization (e.g., exploration, analytics, presentation). Describe a user need for the following interaction operators: panning, zooming, overview reexpression, filtering, detail retrieval, etc. Walkthrough the stages of interaction using different interface controls in an interactive map and identify potential breakdowns and solutions. Deconstruct an interactive map into its basic interaction primitives. Evaluate an interactive map design by UI/UX design recommendations (e.g., affordances/feedback, interface complexity, interface styles, design heuristics). Design an interactive map suitable for a given set of user needs. Perhaps the two most common kinds of mapping interfaces that geospatial professionals experience today are simple web maps (e.g., Apple Maps, Google Maps) and fully-featured GIS (e.g., ArcGIS, QGIS). These UX design contexts could not be more different! Compare and contrast these two UX contexts according to user needs, potential breakdowns in the user experience, recommended UI controls, etc., arguing why these two kinds of mapping interfaces necessarily should be different. In lab ___, you created an interactive map depicting ___. Use the stages of interaction framework to walkthrough how you envisioned a first time user to interact with your map (i.e., work through multiple loops of the framework). Identify potential breakdowns in your design and discuss UX design solutions to enhance your interactive map in the future. Navigate to your online campus map. If interactive: Critique the campus map according UI/UX design recommendations (e.g., which interaction operators should be added to / removed from the map? how could your university develop a better visual brand through the campus map?). Present your critique as a series of recommendations for improving the campus map. If static: Assess how the campus map should take advantage of interactivity according to UI/UX design recommendations (e.g., which interaction operators should be added to the map? how could your university develop a better visual brand through the campus map?). Present your assessment as a series of recommendations for making the campus map interactive. You have been given a description of unmet user needs and target user personas for a proposed interactive map (derive from class readings/discussion). Develop a requirements document outlining the functional scope of the proposed interactive map. Include notes about the recommend interface freedom and flexibility for each interaction operator included in the requirements document. You have been given a description of a use case scenario for an interactive map and a requirements document proposing the functional scope of the interface to support this use case (derive from class readings/discussion). Sketch a prototype of the interface based on UI/UX design recommendations, including an example map representation. Annotate the sketch with notes justifying the interface styles used to implement each operator, the layout of interface controls, and aspects of the visual design that produce a coherent look and feel.